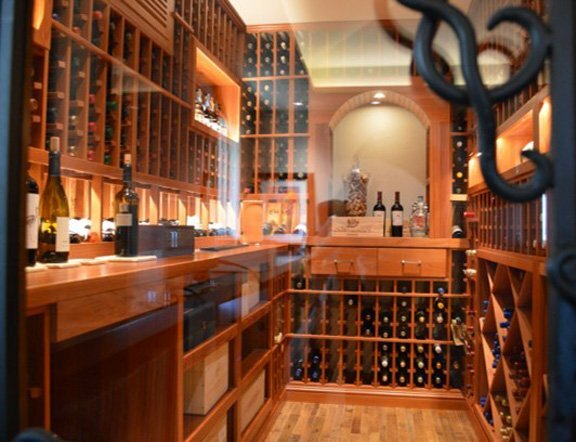 So you live in SF, own a beautiful house or condo that is now whispering “it’s time to have a wine collection in a handsome wine cellar.” Wine collecting can be as light hearted and dilettantish as you like or a very serious pursuit worthy of name dropping and splashing mega bucks on a Euro-style cellar. Here’s some advice from a wine lover named Solomon who already has years under his belt of functional wine cellars and established collections. 1) The space you think you’ll need won’t be large enough in a while, so build it bigger if you can. Oenophile Solomon started with a cellar sized to house his 400-bottle treasure and within a number of years ran out of room, forcing him to store 700 bottles at an out-of-home site. He wishes he’d built an 800-bottle capacity cellar. Build out as much as you can the first time. 2) Plan for bottles that come in a variety of shapes and sizes. Solomon says standard Bordeaux-bottle size racks, which he started with, haven’t worked out for his champagnes and other Burgundy or California wines. He recommends putting in large format bottle racks to accommodate a variety of bottle sizes and shapes. Or buy a mix of standard and large. 3) From the outset, track your inventory. If you think you can remember where everything is or its provenance, you won’t—according to the very experienced Solomon. He says you should set up an inventory management system right away with your first few bottles. You can do this on Excel but he recommends a cellar tracking software. More on choosing wines in an upcoming blog.